This solution covers how to create a Learnosity-powered assessment product, driven by our hosted authoring platform for Item & Activity creation. Have in-house or contract authoring teams. Want to leverage an existing authoring platform for assessments, rather than extending their own. Want to deliver a test or form-based experience - whether that's fixed form or adaptive. A company, Weyland Corporation, is a mid-sized corporate compliance company that provides a series of workplace safety training courses to employees of Fortune 500 companies. These online courses cover areas such as Legislation, Hazard identification, Fire Safety in the Workplace, Emergency & General Safety Procedures. A client of Weyland's will purchase a course for their employees, who will receive a link where they log in and study the material online. Weyland also provides a printed questionnaire for each course, which the employee will complete an review with their manager, to ensure they understand the topics covered. Digitize the questionnaire that the manager uses to evaluate the employees. Integrate the questionnaire into the existing system where users can access it. Automate the marking of that questionnaire. Produce an automated report for the manager to show which employees have completed the course. Figure 1: logical architecture diagram for Weyland's assessment solution. This Learnosity-hosted authoring environment will allow Weyland to digitize their printed questionnaire. This will be done by creating content in the form of 40 'Items' to match the 40 questions asked in the printed questionnaire. Requires zero development time, just log in and start creating Items on day one. Provides the tools to author 65 different Question types. Provides useful Features, such as video and audio players. Allows users to apply their own Tags to each Item, for sorting and reporting. Saves all content to Weyland’s Learnosity-hosted Item bank. Provides the assessment part, where students can take their tests. This will be embedded inside of Weyland's system. Pulls down Weyland’s content (Items) from their Learnosity-hosted Item bank. Presents those Items in a cohesive and intuitive assessment 'player'. Provides many assessment aids for users, such as accessibility tools, review screens, answer eliminators, etc. Can optionally allow assessments to be saved and resumed later. Automatically builds a series of standard report types based on the results of Weyland's auto-scored assessments. Embed these reports on Weyland’s web page with just a few lines of code. Display these reports to Weyland employees, managers, or both. 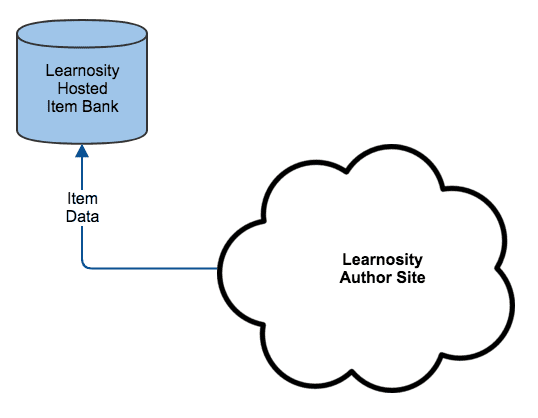 Authoring of content (Items) can be done using the Learnosity Author Site. This requires no development work whatsoever, because it is a Learnosity hosted service. We simply provide you with credentials that allow you (and your colleagues) to log in to your empty Item bank and start creating Items. Figure 2: Items are stored in the Learnosity hosted Item bank. Weyland staff can create Items using 65 different Question types. They can then use the Author Site to assemble those Items into 'Activities' for the students to engage with. Each of those Items is identified using an Item reference and the Activities have an Activity reference. Once the questionnaire for each of the Weyland courses has been recreated in the Learnosity Author Site, the Activity reference for each of these can be stored in the Weyland database. These will be used later when displaying the Activities to users as they take their tests. Figure 3: the Activity reference is stored in the Weyland database. This completes Weyland Corporation's authoring process. The assessment experience is embedded within a web page in Weyland's system. This is done using the Items API in 'assess' mode. Figure 4: embedding Items API. In the existing workflow, the end-users (employees) will log in and study the educational material online in Weyland's system. We now need to add another online step, which is the assessment. When the users are ready to begin their assessment they will click a link which will take them to a web page where the Learnosity Items API displays the appropriate Activity (a collection of Items) for them. It will take the ID of the appropriate Activity and the ID of currently logged in user (employee) as two of its parameters. No personally identifying information is used. 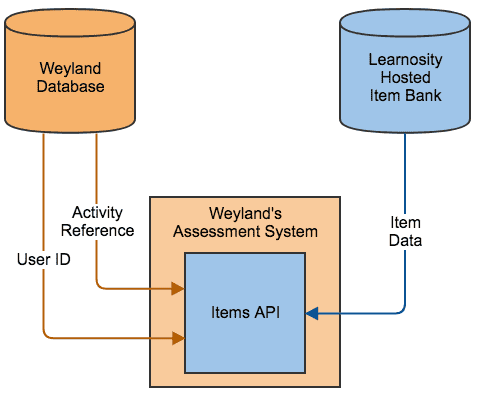 Figure 5: the Weyland database provides the user ID and Activity references to Items API. As the user (employee) interacts with their Activity, they can save their work or submit it for final grading. Both of these processes are handled entirely by Learnosity. The only thing Weyland has to do is to be sure to save that the user with this user ID has completed the Activity. In addition to user ID, Weyland will need to make a record of the session ID and Activity ID for reporting later. A session is one user taking one assessment, a unique session. The Activity ID is used to group users together, for example all employees at a specific branch could have a specific Activity ID. 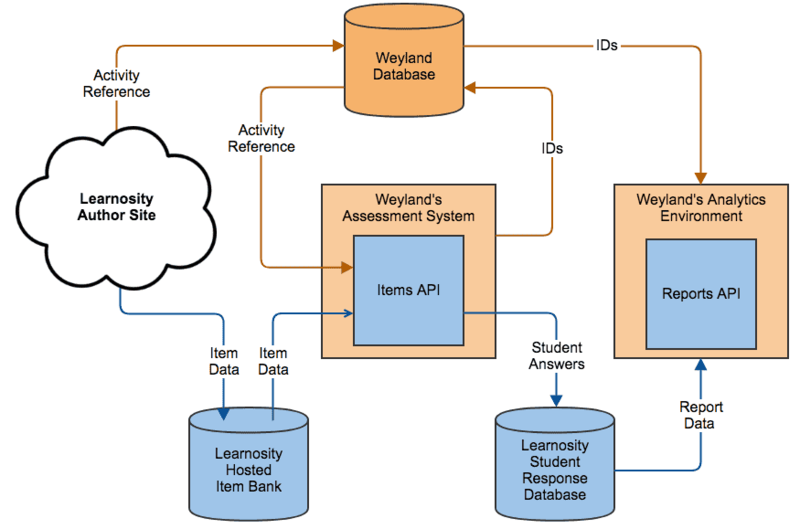 Figure 6: student answers are stored in the Learnosity student response database. Let's recap what has been created so far. 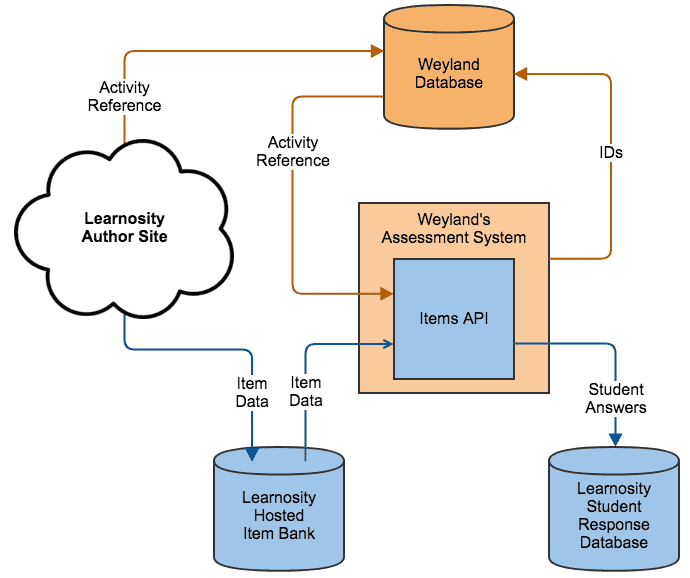 Weyland has used Learnosity's Author Site to create and store all the Items and Activities required for their courses. They just have to store the Activity reference on their side. Then, when it's time to present those Activities to their users, they just need to pass a few relevant IDs from their side along with the Activity reference for Learnosity to render the assessment experience. 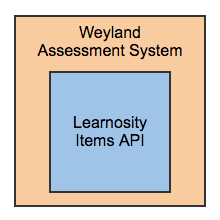 Figure 7: Weyland's solution showing authoring and assessment phases. The IDs referred to above are the user ID, session ID and Activity ID which were described earlier. Finally, we will deal with the analytics part. Weyland needs to provide the manager of each group of employees with a report showing how many of the employees have passed the test. This can be done with Learnosity's Reports API. There are more than one way to do this so the development team can select the report they prefer. 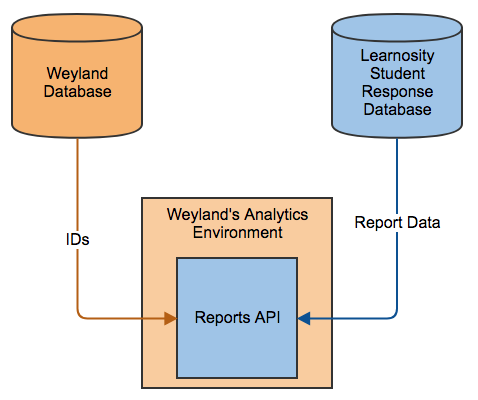 Like the Items API, the Reports API will render Learnosity reports inside Weyland's environment. 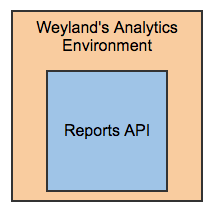 Once a user has navigated to the right place in Weyland's analytics environment, the Reports API can be used to render reports on the page. Figure 8: embedding Reports API. The IDs which Weyland saved from the last step, during the Assessment experience, can now be passed to the Reports API to produce reports on individual employees or groups of employees. 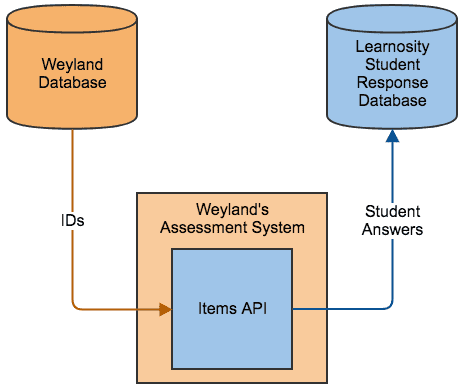 Figure 9: the Weyland database provides user IDs, and the Learnosity student response database provides the report data. Let's stand back and have a look at the entire system. Figure 10: logical architecture diagram for Weyland's assessment solution. By using this workflow, Weyland was able to allow their authors to create 65 different Question types, render them as an assessment for their users, and get detailed reporting. The only thing Weyland had to store on their side were a handful of references and IDs. Create the 40 Items needed for each of their questionnaires. Learnosity Authoring team will provide training. Assemble those 40 Items into Activities and store the Activity references in the Weyland database. Add a web page where their logged in users can take an assessment. On this page initialize the Items API using the required IDs and references, which includes user ID and Activity reference from the Weyland database. Add web pages where the manager (and optionally, the employees) can see reports. Select appropriate reports from the 20 pre-built Learnosity examples. Initialize the Reports API with the relevant IDs to generate the reports.